DETROIT - His first trip to Comerica Park, in 2005, had ended in disappointment, as Jason Bay was left to watch Bobby Abreu smash the record for home runs in a single round of Home Run Derby. Bay, representing Canada and the Pirates, did neither proud, hitting a whopping zero. Bay's chance at redemption on that visit never came. He remained on the bench for the entirety of his first All-Star Game, one that came with Terry Francona across the field in the American League dugout. No home runs, not even a plate appearance. "Dave Page, our strength coach, said they had staff BP here, and he said he hit a home run off the foul pole, so that's one more home run than I hit when I was here," Bay said. "So, yes, I do remember. "Abreu hit 28,000 and I was up after him. I just sat there the whole time." So it was that he stepped to the plate at Comerica in the third inning last night against the Tigers. He had struck out in his first at-bat, but his lack of luck in the Motor City would stop right there. Bay lifted a pitch from Detroit starter Rick Porcello into the stands in left field for his 16th home run of the season, a two-run shot that broke up a tie game and pushed the Red Sox to their second straight win, this one 5-1 in front of 25,914. It was a game notable for a runaway squirrel (on the field and in the Red Sox dugout) and for Sox pitchers being able to extricate themselves from a jam or two. "J-Bay gets one pitch," Francona said. "He's so dangerous. They made some pitches, and all of a sudden there's a ball that's up in the zone hanging, and he just crushes it. He's been that type of hitter, but it's nice to see him do it for us." This was not just a victory over the AL Central-leading Tigers, or a relatively rare win on the road. 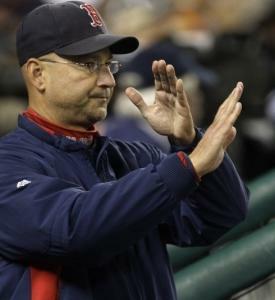 It was also Francona's 500th as Sox manager, making him the third to reach that milestone for the organization. Jonathan Papelbon, however, made him wait. The closer capped the game in as tenuous a manner as his starter had begun it, loading the bases on three singles, then taking 11 pitches to strike out Josh Anderson for the first out. He struck out Jeff Larish and Ramon Santiago, both swinging, to finish off the inning and the win. "I just really basically tried to get my fastball command back," Papelbon said. "I was kind of falling behind hitters there. "Tonight was just a classic situation where the ball found holes. You can't really do anything about that but just keep grinding it out and keep battling and keep trying to make pitches. "I kind of just said, 'I'm not going to let this happen.' I stepped off the rubber, kind of regrouped and refocused." He saw that Anderson, who fouled off nine pitches, had gotten defensive. And Papelbon knew he could exploit that. After a 35-pitch inning, he was out it. The Sox were up four runs courtesy of a remade lineup that has produced 13 runs in two games after the previous one produced 11 in five games. That lineup backed up the "magic man," as Bay referred to starter Daisuke Matsuzaka, who finally recorded his first win of the season to go along with his three losses. With his season already interrupted by a month on the disabled list, Matsuzaka had matched his loss total for the entire 2008 season by May, with no wins to show for it. That changed last night. Though he started with a 25-pitch first inning, it was the Matsuzaka who was strangely effective last season. "He can create some jams, and then he can get out of the jams," Francona said. "It's a high pitch count. Leadoff walk, some guys that got on base, where again he got himself into a little bit of a mess, but he finds a way to get himself out. "That's better news. It's not perfect, but I'd rather be talking about that than saying of a guy, 'Well, he got in a jam and he gave up six.' That's worse." In the epitome of a Matsuzaka moment, he walked the first two batters of the fifth inning, No. 8 Gerald Laird and No. 9 Santiago. Trouble, right? Not quite. He got Clete Thomas swinging, got Placido Polanco to fly to left field, and got Magglio Ordonez on a weak swing to end the inning. That was it for Matsuzaka, who was removed after five, having thrown 96 pitches. He left a lead to Manny Delcarmen and the rest of the bullpen. The Sox were giving him plenty of run support. Dustin Pedroia and J.D. Drew combined for a double and a single to push across a run in the first inning. Bay hit his homer in the third with Drew aboard, then the Sox added two more in the sixth, though it could have been more. They loaded the bases with one out, getting a run home on a bases-loaded walk and a bases-loaded hit by pitch. That left it up to the bullpen - and to Papelbon, who has rarely had an easy outing this season. "They all come down to circumstances, like tonight was a situation where balls found a hole," Papelbon said. "You can't do anything about that, so for me to sit there and dwell on that and worry about it is only going to hurt me. "I've got to keep moving along and keep moving on to the next thing, and not let those situations get the best of me. It's easy to let that happen."